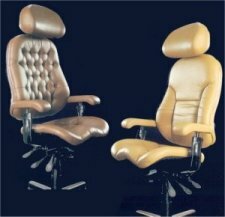 Bodybilt Executive Ergonomic Chairs set the ergonomic standards for executive office chair manufacturing. That is why we rely on Bodybilt performance, comfort and durability; and have for 14 years. BodyBilt Executive Chairs & BodyBilt Management Seating provide today's managing executives with the advanced ergonomics they now require without compromising luxurious comfort and style consistent with their higher level position. Beyond time spent on the phone or doing paper work, today's managing executives spend more time involved in desktop-intensive tasks like handling email, accessing the web or retrieving information from the company network. for tasks such as teleconferencing, interviewing, reading or just kicking your feet up, Bodybilt Executive Chairs feature a larger backrest for increased support in a reclined posture, and a gentle rocking motion in the free floating position. BodyBilt Executive Chair mechanisms allow seats to be locked into a forward tilting posture, bringing the user closer to their keyboard or desktop when performing desktop-intensive tasks - yet, these models will still rock, or lounge back should you so desire. The Executive line offers either the J-Style or K-Style mechanisms. Use the following form to begin configuring the chair which best meets your needs. Once you have made the selections below, click the "Continue Configuration" button which will take you to a page where you will select specific upholstery color and other available options. Users weighing over 285 lbs require one of our Big and Tall Models.